Given the happenings in Newtown, Connecticut last week, I’ve hesitated to post a holiday recipe. It seems so shallow. Yet life goes on, and food adds to our humble pleasures, connecting us all at the table. So here is a favorite holiday side dish with a distinctive flavor twist – Angostura bitters. When I whipped up these potatoes last Christmas, eyebrows were raised with smiles. Make it a day ahead and refrigerate. Just before serving, heat in the microwave. I usually refrigerate the finished potatoes in the same bowl or covered casserole dish in which I’ll heat and serve it. Simple. Peel and dice potatoes. Place in a large pot; add water to just cover potatoes. Stir in onion, garlic, salt, and if desired, thyme or rosemary. Cover and bring to a boil. Reduce heat to medium; cook 10 minutes or until potatoes are tender. Drain well. Add butter to potatoes in pot. Use an immersion blender or electric mixer to whip potatoes. When smooth, stir in sour cream and Angostura bitters. * Salt always means table salt unless otherwise noted. Table salt has more sodium than Kosher salt. If kosher is your preference, add a bit more than 1 teaspoon. I am embarrassed to admit it, since I’ve know you for over a year now, I’ve not yet tried Angostura bitters, but this recipe is going to get me out to buy them. 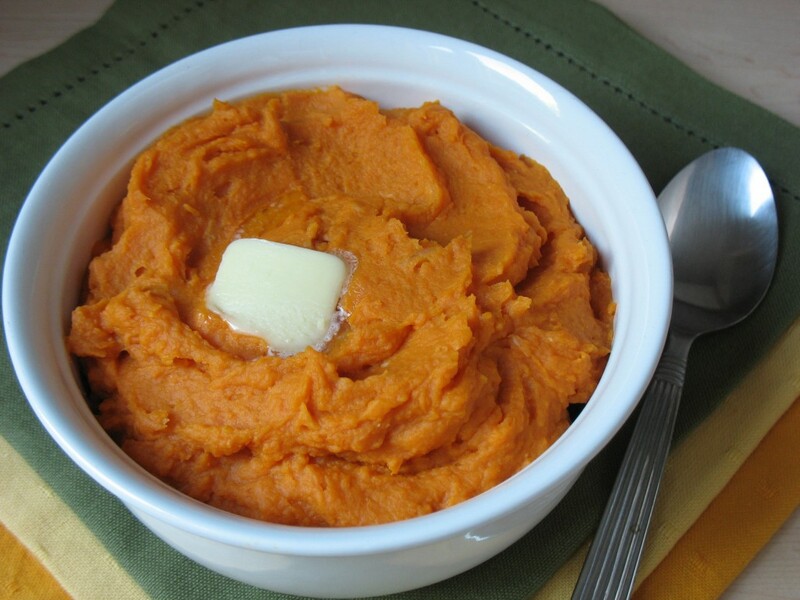 This sounds wonderful – I love the addition of the yogurt to the sweet potatoes too. Angostura bitters is in the liquor section of supermarkets or in liquor stores. Let me know how it goes and what others might think. Don’t tell anyone what’s in the sweet potatoes until after they taste and comment. Merry Christmas, Susan!